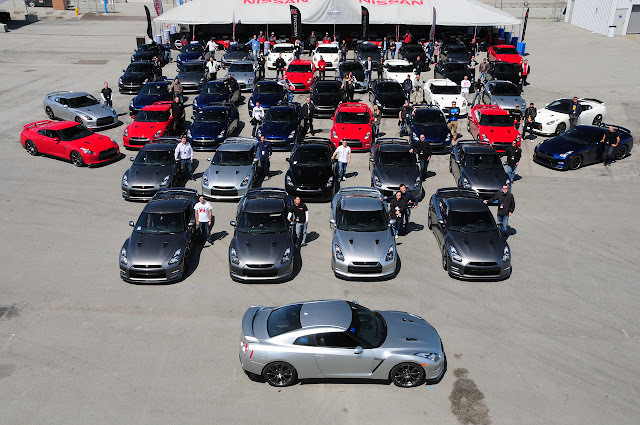 Nearly 80 west coast Nissan GT-R owners, plus journalists got to attend the second 2013 Nissan GT-R experience. This event was held at Mazda Laguna Seca Raceway in Monterrey, CA. In this special report from Douglas Kott from Road and Track Magazine, he recounts his day. And Nissan has done GT-R owners proud here at Laguna Seca Raceway, the second of three driving events held at no cost to GT-R owners (the first was at Palm Beach International Raceway in Florida; the last is planned for Monticello Motor Club in New York). With tutelage from Skip Barber driving instructors, it’s a day of lapping, autocrossing and other drills for owners in their personal cars, capped off with four or five laps in a Nissan-supplied 2013 GT-R. There are also a number of prospective GT-R buyers, hand-selected by Nissan dealers, in attendance. I’m just along for the ride, so to speak, one of a dozen or so journalists invited to attend and drive in 2012 GT-Rs. A real twist-my-arm scenario!! GT-R's lined up ready to go. It’s a huge thrill to get into a car as powerful and competent as the GT-R on a historic track, and our final stint in the 2013 car was exactly 15 bhp more exciting: Output of the twin-turbo 3.8-liter V-6 has been increased to 545 bhp. The new 20-in. wheel design looks fantastic (and shows off the monster rotors and fixed calipers to great effect), and now there’s a carbon-fiber rear wing whose exposed cloth weave pattern is unique to the GT-R. Whether a 2012 or 2013, the GT-R is a formidable, focused machine built to a purpose: undercut the Porsche 911 Turbo on price, yet beat it around Nürburgring’s Nordschleife. Check out the links to the pictures from the events. One more coming up later in New York. Its great to see Nissan doing these events in the US. As the second largest GT-R market in the world, the US buyers have been a little neglected until now.